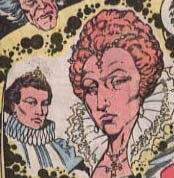 History: (Avengers West Coast#53 (fb) - BTS) - Earth-Elizabeth I Executed apparently diverged from Earth-616 during the 1500's when Elizabeth I chose not to have her cousin, Mary, Queen of Scots, executed. This was a mistake, as Mary, Queen of Scots eventually managed to depose her cousin and become queen of England herself. Elizabeth I was imprisoned for several years in the Tower of London. Earlier, Immortus, while investigating this world, popped up as "Lord Immortus" during the time of Henry VIII's reign and Elizabeth I's time as a young girl. (Avengers West Coast#53) - Mary Queen of Scots decided to have Elizabeth executed. She had a final meeting with Mary, Queen of Scots and "Lord Immortus"before her execution. A cardinal came to announce to Elizabeth it was time for her death, and Mistress Belle and Mistress Lettice came to assist Elizabeth. She was wearing the same gown that she had worn the day years earlier when the Stuart's agents had imprisoned her in the Tower of London. Elizabeth had a final talk with "Lord Immortus", noting that she always wondered how Immortus came and went "like the thief in the night" and how she remembered him from her days as a girl, yet he had not aged a day since the death of her father, Henry VIII. Mary, Queen of Scots, exultant, somehow thought with Elizabeth gone, she would now "rule the world!". However, Immortus then erased this timeline. For those of you who think they might have accidentally stumbled into a Masterpiece Theatre site, I will explain. Around issues#50-61 of Avengers West Coast, Immortus was shown erasing various alternate timelines. Most of these timelines were shown in quick cameos of a page or two. Interestingly, they generally did not involve divergences related to usual Marvel characters, but rather historical figures such as Abraham Lincoln. 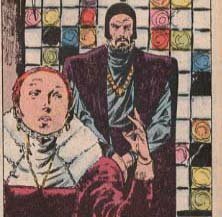 An odd sidebar is that many of the historical figures shown in these quick vignettes (Elizabeth I, Abraham Lincoln, Napoleon) came at points of history after Immortus' native world (Other-Earth) diverged from Earth-616. Immortus' world diverged from the history of Earth-616 (and that of the real world) around the time of the fall of the Roman Empire, since in Immortus' world, the Dark Ages never happened. This was established in Fantastic Four I#272-273. However, as also shown in those Fantastic Four issues, during the pre-modern era, Nathaniel Richards from Earth-616 travelled to Other-Earth and became an important leader there. 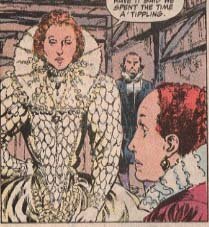 As established in a back-up in Captain America Annual#11, Richards had historical records of Earth-616 figures such as Captain America with him, so he may have also had records about Elizabeth I, Abraham Lincoln, et al. --I'd say Immortus, who sought to be the whole master of all time, has extensive records on every single timeline--Snood. Oh, for some historical background; on Earth-616 (and the real world) King Henry VIII of England, of the Tudor family, had broken with the Roman Catholic Church in 1534 when it refused to annul his marriage to Catherine of Aragon. (Catherine of Aragon had failed to provide Henry VIII a son, and only had a daughter named Mary.) Previous popes had performed such annulments. However, Catherine of Aragon was the aunt of Emperor Charles V/King Charles I, a powerful Spanish ruler who desired to bring the inheritance of the English throne into his family. So, the pope refused to annul Henry VIII's marriage. As a result, in 1534 the English parliament passed the Act of Supremacy, which made Henry VIII the head of the Church of England, severing England from the Roman Catholic Church. Anglicanism began. After the break with Rome, Henry VIII had a daughter named Elizabeth by his second wife, Anne Boleyn. Anne Boleyn was later executed for adultery. Then Henry managed to have a son Edward, by his third wife, Jane Seymour. (Jane Seymour died in childbirth.) Henry died in 1547 and Edward became king at the age of ten....and died a few years later in 1553. So the aforementioned Mary Tudor, daughter of Catherine of Aragon, became queen. Mary, who had stayed Roman Catholic while the rest of the family changed over, inherited the throne, and she married Philip of Spain in 1554. Mary I and Philip introduced the hallmark fanatical brand of Roman Catholicism that has made the Hispanic countries the paragons of democracy and prosperity they are today, initiating mass executions in which 300 persons were burned at the stake. Mary I died in 1558. Elizabeth, the previously mentioned daughter of Henry VIII and Anne Boleyn, became an enemy of the Roman Catholic Church, for a very simple reason. Her father had broken with the Roman Catholic Church in the first place in order to allow himself to marry Anne Boleyn, so the Roman Catholic Church considered her illegitimate and not the rightful ruler of England. The popes of the time (Paul IV and Pius IV) explicitly told any English Roman Catholics to disobey and revolt against Elizabeth. The fact that the Roman Catholic Church did not recognize Elizabeth I as the legitimate queen of England intrigued the next person in the line of succession, namely Mary Stuart. Mary Stuart, Queen of Scots (1542-1568) was a great-granddaughter of King Henry VII of England. Mary was married to the French king Francis II, who only ruled France from 1559-1560. As a member of the French royal family, Mary Stuart remained Roman Catholic while in England itself the switchover to Anglicanism took place under Henry VIII. After the death of Francis II, Mary Stuart returned to Scotland, where she ruled as queen. (Note: Scotland and England were separate countries at this point in time, but since their royal families were related-as were all European royal families-Mary inherited the crown of Scotland.) However, a problem occurred, since, while as noted above, Mary Stuart stayed a Roman Catholic, while she had been away in France, the Protestant leader John Knox had converted Scotland to Presbyterianism. Thus, the Scottish aristocrats, working together, banished Mary Stuart from Scotland. Mary went to England, where she was imprisoned by her cousin, Elizabeth I. Mary Stuart was a problem to Elizabeth, since as Elizabeth had no children, Mary Stuart was the next in line for the throne-and if one did not consider Elizabeth I the legitimate queen of England, Mary Stuart was the rightful queen already. The Spanish monarchy, the Jesuits, and many English Roman Catholics constantly schemed to get the English throne for Mary Stuart. The Spanish kept badgering England in an attempt to destroy Anglicanism and make Mary Stuart the queen. King Philip II of Spain prepared for an invasion of England with his armada. Elizabeth I's top secret agent, John Dee, deciphered a secret message implicating Mary in a conspiracy. So, in 1587, after almost twenty years in jail, Mary, Queen of Scots, was executed. Mary Stuart, Queen of Scots, should not be confused with Mary Tudor, Queen of England. Mary Stuart never ruled England. Elizabeth I of Earth-Elizabeth I Executed goes to her death. Mary, Queen of Scots, with "Lord Immortus".